It’s a brave new world for everyone and this episode served us a wild trip with a flavor of 1984 in it. And they did it right. Let’s recap. In this alternate universe, Ward is alive, he is Daisy’s avatar’s boyfriend, and she goes by the name of Skye. They work for Hydra and so does May. She is actually number three there “and way more damaged than in the real world”. Fitz is number two and his lover, Aida’s avatar (I’m guessing it’s her avatar), is number one. Hydra rules over the United States, where they established an anti-Inhuman authoritarian government. Coulson was never an agent, he is a teacher and very loyal to Hydra. Finally, Simmons’ avatar was murdered. There is a pretty good explanation to how things came to be the way they are: Bahrein. May saved the Inhuman girl instead of killing her and the girl was brought back to the United States. But since she was evil, she killed a lot of people. Hydra seized the opportunity to claw its way out of S.H.I.E.L.D. and unite everyone against the Inhumans. Fitz probably spent way too much time with his father (his regret had something to do with him), which is likely the reason why he joined Hydra and became an evil overlord. Simmons, however, was loyal to S.H.I.E.L.D. and Hydra murdered her. The only loose end is Daisy, but I’m okay with accepting that her season one interest in S.H.I.E.L.D. led her to Hydra on this universe. Meeting this new world is quite a ride for Simmons and Daisy, dramatically and comically. Curiously, Daisy searches for Lincoln on the computer as soon as she can, only to find out that he died during “testing”. Her reaction, “what did they do to you?”, shows that only a few hours inside the Framework and she is already treating it as the real deal. Good lies can be quite convincing, even when you know they are lies. My favorite scene of the episode was Simmons trying to convince Coulson that he had been brainwashed. Initially, she did a terrible job. To be fair, Simmons and Daisy were not prepared for the severity of the brainwash their friends had gone through. Also, how the hell do you tell a person that the world and their memories are fake? Is there a non-terrible way to do it? I would say “no”, but Simmons eventually finds an effective way to confront Coulson when she brings Tahiti into the conversation. 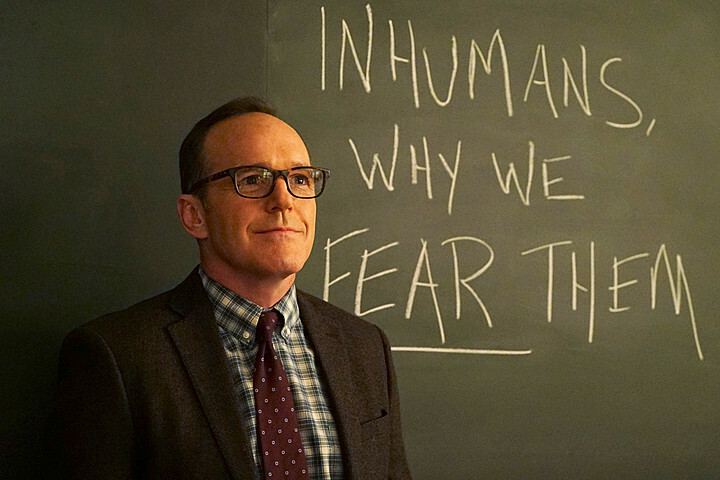 It’s so clever – and very good writing – because Coulson has been brainwashed before. 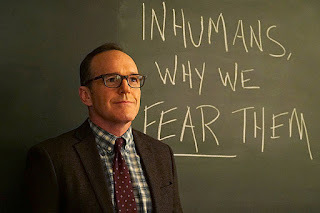 What Simmons says doesn’t convince Coulson right away, but it puts him into enough conflict so that when Daisy talks to him – in a moment that mirrors a season one scene where Coulson confronts a S.H.I.E.L.D. doctor about Tahiti –, he remembers her. Another good bit of writing was the reveal of Ward as part of the Resistance against Hydra. He found out Daisy was an Inhuman and joined the Resistance to protect her. It makes total sense, as he has always been driven by heart. There is something very interesting to be said about how much we can change depending on how things go. Fitz is evil, Ward is good, May has an even bigger regret now. Bifurcations, The OA would say. I’m going to save more on that topic for future reviews, as I have the impression the show has just begun to dip into these waters. I don’t believe it’s all Butterfly Effect when it comes to how different things are in the Framework. Aida changed the Framework and inserted a version of herself there – who the Marvelites have identified as comic book character Madame Hydra – to keep things in place. She has an agenda that is aligned with the Darkhold, and for some reason they need a world with Hydra in command. Some fans have theorized that the Darkhold is a failsafe for Hydra, and that could very much be the case. I believe, like I said before, the Framework can become a real world. Maybe that’s the Darkhold’s endgame: to supplant the world with a twisted version of it. - I have enjoyed Daisy and Simmons' team up a lot during these last two episodes. They play off each other very well. - Simmons has become such a capable agent, taking down those state policemen and stealing their car. You go, Jemma. - The lady who gave a ride to Simmons was very nice. Can’t blame her for being so frightened, though. The only time I gave a ride to a stranger I was very worried and I don’t even live under a dystopian regime. - Brainwashed Coulson let a student of his be taken away by the state police. - Vijay Nadeer is captured by Hydra and has not gone through terrigenesis yet. - It’s going to be cool if Daisy goes through terrigenesis again. - Hey, show, it took me forever to get used to “Daisy”, don’t confuse me now. - No Mack. No Mace. No Yo-Yo. No real world in this episode. - Do you guys think the show is trying to say something about, uh, make America human again? No intent to provoke here, that’s an honest question. - Elizabeth Henstridge was sick during the filming of this episode, which actually fit Simmons’ situation very well and contributed to Henstridge’s great performance. - There was a Bill Paxton tribute before the final credits rolled. Rest in peace, Bill. Another great one. Four out of four Hawaiian dolls. I really liked this episode, and I'm excited for where the writers will take this third of the season. I do hope evil!Fitz gets his memories back soon, and that poor Simmons doesn't have to see too much of that side of him - robot!Fitz was bad enough. I love that they were able to get through to Coulson because he'd already been brainwashed before - good continuity. And I cannot express how cathartic it is to have good!Ward in the Framework! I was never a huge SkyeWard shipper, though I do like a good reformed bad boy character (a la Spike, Damon, Logan Echolls), and would have enjoyed if Ward took that route. I grew a bit tired of how many different ways they tried to keep Brett Dalton in the cast as his character became more and more evil. Having a what if scenario explore Ward making different choices redeems the character, despite only virtually, and should enable Dalton to leave the show on a high note. Wonderfully crafted alternate universe with so many nice callbacks to the shows history. I actually like seeing Ward again, it makes sense he's there. I don't know if we will see any real world action at all during this part of the season, but they did film all the scenes in a subdued color paletter so there is a at least a possiblity. Doesn't Aida has a human prototype (forgot her name), who is actually IN the Framework? And has a very clear motive to keep the Framework running? And who, by the way, has a thing for scientists? I found this episode hard to watch. For some reason, episodes where people have to convince others they are who they aren't, are always hard for me. So I was constantly pausing it, and it took me quite some time to finish. But I love Phil Coulson, and I'm fascinated that he's the first to remember. It does make me worried though that he might not make it out alive. OK, time for the next episode, I guess.